Poets & Writers, quite pre-professional, nonetheless fairly often admits or implies that young writers who get MFAs might want or need to do things other than join the academy, where “Creative Writing” programs as such are often if not mostly deemed fringe zones of mere practice. 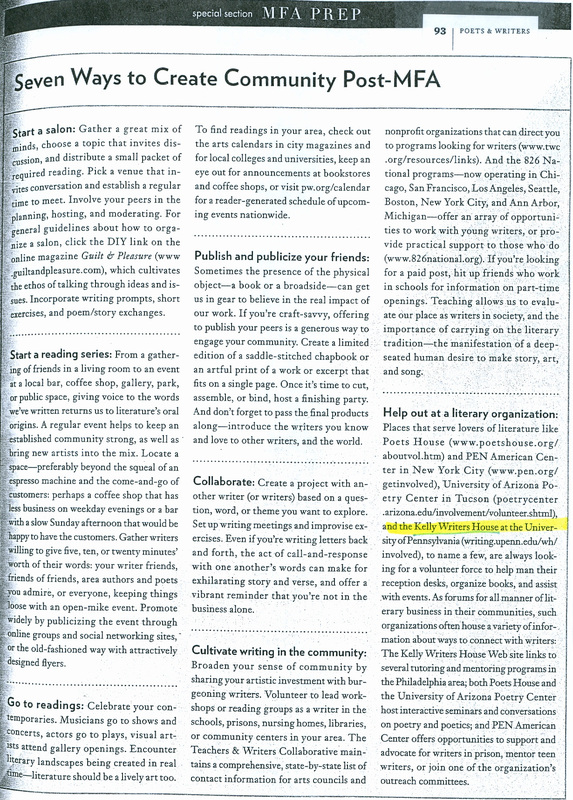 Anyway, I was pleased to see that the magazine’s latest stab at alternative options includes advice for young writers to “Help out a literary organization,” and mentions the Kelly Writers House as one such site. Below is the relevant passage (click on the image for a larger view). And click here for the whole article.